Weighty Matters: Are you a Bad Parent? "Their day. Made by Mom. My kids are always on the go. That's why at breakfast it's important to give them food that helps keep them going throughout their busy day - like Nutella. Kids love the delicious taste of Nutella. And I love that it's made from natural ingredients, contains no preservatives or artificial colour and is a source of Vitamin E. I feel good about making Nutella part of my kids' nutritious breakfast." I don't think you're a bad parent if you feed your kids Nutella - for many kids it's a sometimes food treat that they genuinely enjoy (go figure, it's spreadable candy). I would however worry if you let yourself get duped by Nutella's advertising into thinking it's part of a "nutritious" breakfast, and that because it doesn't have preservatives or artificial colour and is a source of vitamin E it's a smart choice. You might as well just spoon 100% natural, no preservatives added honey into your kids' mouths and call it "nutritious". Of course, if you do choose to go the honey route, remember to spoon in 36% more honey than Nutella, because Nutella's got 36% more calories spoon per spoon than the honey. Don't want to spoon in honey? How about 100% natural, no preservatives added pure white table sugar? 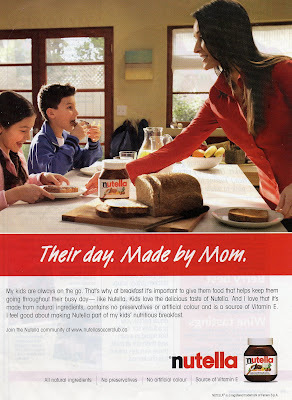 Of course if you go the sugar route for every tablespoon of Nutella you'd planned on feeding the kids you'll have to give them 2 tablespoons of sugar to make sure they get the same amount of "nutritious energy" that the Nutella would have provided.